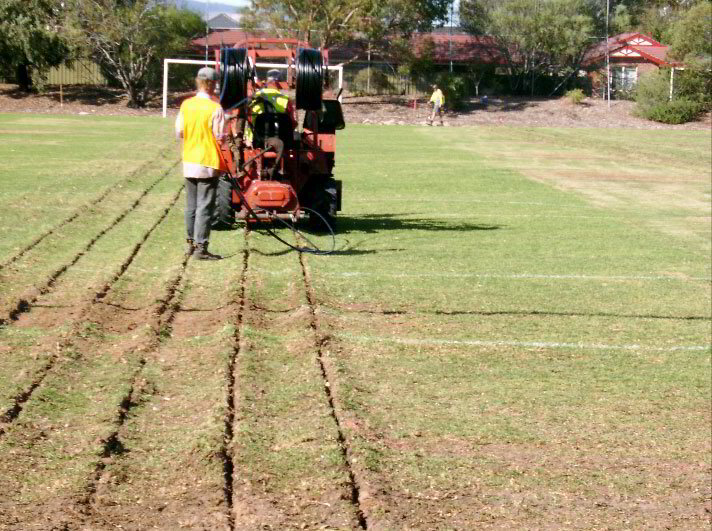 Greene Eden has been successfully installing sub-surface drip irrigation systems in turf since 1993 with acceptance growing during the drought in the early 2000’s when irrigators starting acknowledging the obvious advantages of this irrigation system methodology. In summary – attention to detail is vital. Saves water: There is no evaporation, run-off or wind-deflection, ensuring that the water is delivered to the root zone where the plant can make the best use of it. Ideal for odd shaped areas. Fertilising is safe and efficient as it can be injected directly into the system. Low Pressure System: the system requires less pressure to work efficiently so is suitable for areas where pressure is a problem.